The Loudoun Valley (VA) boys, otherwise known as The Jungle Track Club, grabbed their second national record this weekend as they continue to exert distance running dominance over the rest of the country. After running a mind-boggling 17:01.82 -- a 4:19.75 average mile -- at the 2018 New Balance Indoor National meet, the squad once again took the track to better that record and were able to just edge it out by 1 second, running 17:01.81. The team only had to replace one superstar in Colton Bogucki as it returned the rest of its 2018 squad, but the Vikings were able to do that and not skip a beat with the help of junior Kevin Carlson. The splits from the squad were probably the most impressive thing about the record-breaking run. Connor Wells returned from his 1:55 split on the DMR team to lead off and run 4:22.26. He handed off to Carlson who would split 4:21.46 and hand off in in third. But it was all over once Sam Affolder got the baton and blew the doors off the race with his 4:06.19 split -- his second 4:06 mile in as many days. With a now 15-second lead, it was to Jacob Hunter to secure the victory and deliver a split to break the mark and he did with his 4:11.90 split -- a 5 second personal best for the senior. Christian Brothers Academy (NJ) finished second with their 17:20.33 mark, but let's stay on Loudoun Valley. The team fielded 'B and 'C teams in this event and both of those squads finished under 17:45 with all 12 boys splitting 4:31 or better and 10 of the 12 at 4:25 or better. 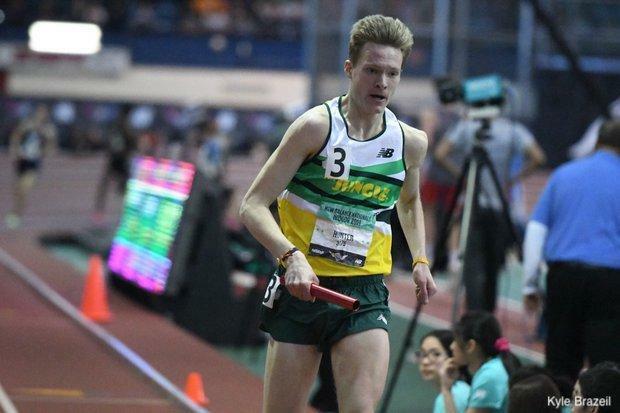 It is safe to say that Loudoun Valley's depth in the distance races in unmatched in 2019 and we should expect to see the Vikings atop the podium at New Balance Nationals for the foreseeable future. Update: The Loudoun Valley boys went on to win the 4x800 Relay as well in another US No. 1 7:40.49. The team was comprised of Jacob Windle, Wells, Affolder, and Hunter.